One aspect of your vSphere environment that shouldn’t be ignored is the built-in security feature that allows you to control who can do what with which vSphere entity. Internally this is controlled from the AuthorizationManager. This object contains all the properties and methods you need to configure and manage the built-in security system. The principle how vSphere entities are protected is quite straightforward. At the basis are the so-called privileges. Each privilege describes a basic action that can be performed on one or more of the vSphere entities. The vSphere environment doesn’t allow you to assign privileges directly to users or groups. You have to bundle a number of these privileges together in a role. There are a number of pre-defined roles , such as “No Access” or “Read-Only”. But you can easily create your own roles. With these roles you can now assign permissions on vSphere entities. You need to select an entity, a principal and a role. All the above can be done from with the VIC. Last year I added some functions to the VI Toolkit for Windows Community Extensions that revolved around roles and permissions. See the vSphere PowerCLI blog for a short overview of these functions. In a recent thread on the VMTN PowerCLI community there was a request for a Script to export VC Roles/Permissions/Objects. Last night there were some tweets from @clinek and @jasonboche that raised the question how these exported permissions could be imported into a new vSphere environment. An intriguing problem. Let’s tackle it. First let’s have a look how the script in Script to export VC Roles/Permissions/Objects exported the permissions to a CSV file. This is an extract of such a CSV file. Looks like a regular CSV file, the properties in the first row and the data in the following rows. In the last row there is a problem. The role “myDomain Network Admins” is not one of the predefined roles. If we need to import the permission described in the last row into a new vSphere, we will first need to import the customised roles. In the VI Toolkit for Windows Community Extensions there is a function called Get-TkeRoles that we can use to list all the roles and the privileges they hold. Luckily the Get-TkeRoles function doesn’t use any PowerShell v2 features, except for the auto-help. That will make it easy to reuse that code in a PowerShell v1 script. The sole reason for using PowerShell v1 is that we aren’t allowed to run a CTP version in our production environment. The custom object that represents a permission and the custom object that represents a role do not have the same properties. That makes it difficult to export both objects to the same CSV. After some consideration the XML format looks the most flexible solution. The XML file that comes out of this looks like this. This concludes part 1 in which we have shown how to export all the required information so that we can later import these permissions in another vSphere environment. Replace parentheses with chevrons, > and <, and you should be all set. Method invocation failed because [System.String] doesn't contain a method named 'Save'. tried a couple of the suggestions, they cause different issues. This looks deceased. #LucD or #Alan can either of you help here? 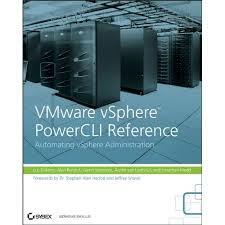 i’m using VMware vSphere PowerCLI 5.1 Release 1 build 793510 for vSphere 5.1 version vCenter and Hypervisor. I have modified the original script as advised upon getting same error as described by other mates in this forum. 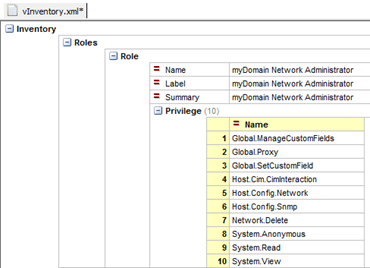 + [XML]$vInventory <<<< = ""
Using the script here (http://blog.vmote.net/documents/Export-vCenter-Permissions.ps1) I exported all the roles and it seems only some of the permissions. I have vcenter 5.0. For instance under a distributed switch there are port groups that have different permissions. Same with datastores, there are folders with different permissions and datastores inside those folders. And the resource groups do not all have the same permissions. The export text file shows Entity=”New-York” (name of the datacenter) and Entity=”Datacenters”. So I don’t see individual port group, folder, data store or resource pool permissions. Is the script supposed to do this? I too get numerous errors regarding calling a method on a null-valued expression. just a sample of the numerous errors. I’m getting the same form of errors as other users. “You cannot call a method on a null-valued expression. $node.AppendChild( <<<< $tmp)" "You cannot call a method on a null-valued expression. At C:\tmp\ExportRoles.ps1:85 char:23 $node.SetAttribute( <<<< $name, $value)" "You cannot call a method on a null-valued expression. At C:\tmp\ExportRoles.ps1:85 char:44 $tmp = $global:vInventory.CreateElement( <<<< $nodeName)" That loops for a while then I get errors like: "Exception calling "AppendChild" with "1" argument(s): "Object reference not set to an instance of an object." At C:\tmp\ExportRoles.ps1:81 char:22 $node.AppendChild( <<<< $tmp) When carrying out the fix as mentioned by Mitchum, i get the same erros but with a new one thrown in: "Exception calling "CreateElement" with "1" argument(s): "The local name for elements or attributes cannot be null or an empty string." At C:\tmp\ExportRoles.ps1:80 char:37 $tmp = $vInventory.CreateElement( <<<< $nodeName) The script is creating the xml file populated with the descriptors, it's just not populating it with any of my roles or permissions. I'm using vCenter 4.0U1 build 208111 and the PowerCli 4.0.1-208462 Any ideas? "Exception calling "CreateElement" with "1"
Is there an update version of the script that works? I too am getting the same result as everyone else..
Can someone correct that and re-post? Thanks for the help VMware peeps!! Thanks a lot. Have been looking for something like this for our environment. Thanks, Al, for another great script. And thanks Mitchum, that fix worked great. One quick question from a newbie, is there any particular application, other than IE, that works well for viewing XML docs? Thanks! and I too get numerous errors regarding calling a method on a null-valued expression. Sie können keine Methode für einen Ausdruck mit dem Wert NULL aufrufen. I had the same problem. I fixed it by replacing the $global: variables by normal one. And this with all global variables. When I run it in the debugger in PowerGUI Script it runs to completion. It is the weirdest thing. You sure you have the following line copied into the script ? It looks as if that variable is not initialised. PS: remove the blanks before and after the < and > characters. There must be something wrong with the XMLpath. But I’m afraid I can’t reproduce the problem. Could you change the Get-XmlNode function like this and send me the output ? Strange that you get no error messages whatsoever. You could include some Write-Host cmdlets at some points in the script to check if the values are actually retrieved. Once again you have written a script that will be great use to me in my environment and saved me the trouble. However, we I run the script I get only the Node headers in the XML and no errors in the PowerCli interface. Is there something that I could be missing when it comes to running the import script? great Script and (not only this one) a lot for great posts on your site. Do I have to do anything "around" the script ? Thanks a lot for you help and thanks a lot for all your other posts !!!! This is a great post about some little features which I just don’t see anyone talking about, and which really shows how mature of product VMware has created. Any chance this exporter would work for 3.5, is all of this new to 4.0? Also may I ask what product you used to view the xml at the end of your post? The export script will work in a VC2.5/ESX 3.5 environment. In fact I wrote the script in such an environment. I used the Table View from WMHelp XMLPad v3.0.2, which is a great freeware product.